The Handbook of Local and Regional Development provides a comprehensive statement and reference point for local and regional development. 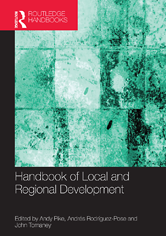 The scope of this Handbook's coverage and contributions engages with and reflects upon the politics and policy of how we think about and practise local and regional development, encouraging dialogue across the disciplinary barriers between notions of 'local and regional development' in the Global North and 'development studies' in the Global South. This Handbook is organized into seven inter-related sections, with an introductory chapter setting out the rationale, aims and structure of the Handbook.